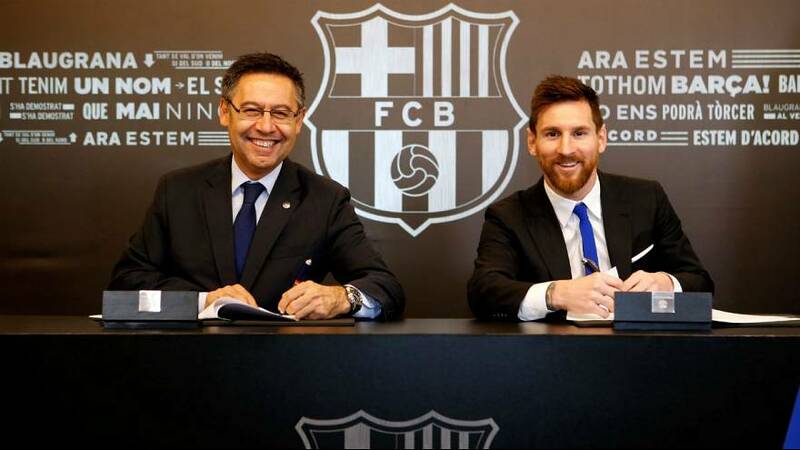 Five-times world player of the year Lionel Messi has finally signed a new contract that will keep him at FC Barcelona until 2021. The Spanish club said on Saturday the deal includes a buyout clause set at 700 million euros. The eye-popping figure aims to keep away even the likes of French team Paris Saint-Germain, which secured Neymar over the summer by triggering his buyout clause with a record 222-million-euro payout. “As I have always said, it’s my home so I’m happy to remain here,” Messi said of FC Barcelona. Messi agreed on the new contract back in July but signing it took a while, fueling speculation he might follow Neymar’s lead and leave. The club said that after Neymar’s departure for Paris Saint Germain it more than doubled Messi’s buyout clause. It did not disclose his salary. On Friday he picked up the 2017 European Sports Media Golden Shoe for being the top scorer in a domestic league last season, with 37 goals. Yesterday – Receives his 4th Golden Boot. Today – Signs a new contract at Barça.